We’re wrapping up the Paper Trading Challenge, and it’s time to see who hosts Tim Bohen and Stephen Johnson declare as champion! While this episode is dedicated to announcing the winner, Tim and Stephen note that there are no losers here. Each of the six contestants gained something from the competition, especially more stock market knowledge. And the final two contestants, in particular, report incredible growth in their trading prowess. Tune into the episode for a recap of the Paper Trading Challenge and a detailed review of the final days of the competition with the last two contestants — Liz and Chris (aka “DJ”). Find out who takes the Challenge crown! Liz: As Stephen notes, Liz is “relentless” in the pursuit of her goals. That’s a very helpful trait when taking on the stock market. Find out how Liz went from “a loser of a penny stock trader” with little knowledge to an absolute rising trader star. Her knowledge of indicators and market rules have grown exponentially. But can she rein in the gambling impulse that every trader wrestles with? DJ: At the start of the competition, DJ had market experience but lacked focus. Through the course of the challenge, he dialed in and found discipline. He reports that his results went from random to reliable, as he focused on the setups that work best for him. Is he ready to take his newfound trading success to the real market? Listen to hear what Tim and Stephen think! 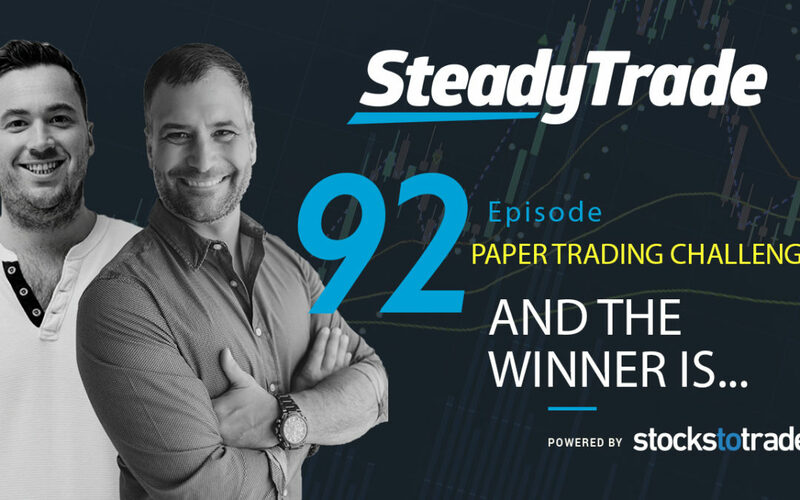 Before announcing the winner of the Paper Trading Challenge, Tim and Stephen discuss some of the key takeaways from the competition. One of the biggest is that you need to find a passion for the process. You need to cultivate a fascination with the mechanics of trading. Stephen asks: “What makes you approach every day as an absolute beginner?” If you can find that spark, you’ll be ready to approach the market and eager to learn every day. For the Challenge contestants, this competition seems to be just the thing to instill a sense of curiosity about trading. It helped them develop the discipline to take it to real-life trading. Tim and Stephen also discuss the difference between a hobby and a passion — and the key difference when it comes to trading. For the final month of the Challenge, the rules changed again: contestants started March with their February earnings. Once the new rules were announced, Liz started scalping like crazy and started with $700K. DJ, on the other hand, ended with $1.6 million. They were also limited to 25 trades and the final tally was measured on winning percentage and the percentage the account grew. DJ made 25 trades and was green on every single one. Liz only made 9 trades. She was green on six. So, who won the Paper Trading Challenge? Listen to the episode to find out! You’ll also get bonus commentary from both Liz and DJ about their final trades, including critiques from Tim and Stephen about what they got right and where they can improve. Do You Want to Be in the Next Paper Trading Challenge? 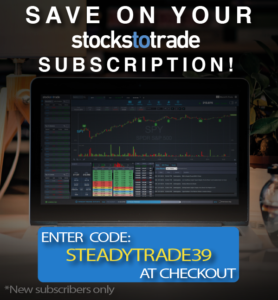 If the SteadyTrade Podcast hosts another Paper Trading Challenge, are you interested in getting in on the action? Leave a comment below or on YouTube and let us know your thoughts and ideas for making it even better next time. How much did you learn from this episode and the challenge? Be sure to leave an iTunes review! Hello, I am interested in becoming a contestant for the next paper trading contest. I’ve been studying daily for about a year now. I’m in the Tim Sykes mentor program. I’ve not yet made a trade yet but I feel like I’m ready and I know I can benefit from this competition. I think you guys also learned a lot from this last competition about what not to do, and what can be done better (as far as shorting rules, not “cheating”, PDT, etc…)… So I’ll leave that up to you… But – I would Love to be a part of the next paper trade challenge… Like the person before said, I have been actively paper trading on TOS (sorry) for 8 – 10 months now, and been with Sykes MMP for the same time… On paper – I started with $5,000, and am now at $110,000… I don’t cheat, I “score” my losses as well, and I keep a very detailed journal. I am sooooo ready to start trading with real $$$!!! However, I have a biz to sell before I can do that (was my plan all along)… Well, the biz is now for sale, and I am still immersed in the markets every single day, and still paper trading in real time daily, and as soon as I can, I will be opening a real $$$ account, and start my retirement funding! (I am 60)… Please consider me for your next competition, as I am confident I can win!… and Learn!… and I would Love to try out SST during this time, so I can be ready for that as well, once the real $$$ start trading. I think that an annual paper trading contest would be outstanding. It really helps people to focus on learning, trading and being successful. You can then have a STT Paper Trading Hall of Fame where rah winner is enshrined. We can learn about them, and you can periodically follow up to see how they are currently doing in their trading. Of course I would love the opportunity to participate, who wouldn’t? Ya’ll for sure should do another paper trading challenge. Watching the contestants grow, and learn helped me a lot as a trader. As ya’ll say your podcast is for the newer trader, and getting to see some newer traders learn the patterns and become profitable was really inspiring and just makes me want to study even harder. I would love to be apart of the next paper trading challenge! I learned about penny stocks in November 2018, and since then I have been watching all of Tim Sykes videos on YouTube and I have listened to all your podcast! I really want to be mentored by Tim and Stephen. They taught their students a lot, and I know being apart of this challenge would teach me so much. Thank you for all the free content ya’ll put out, and I can’t wait till the next podcast comes out! I have watched three of Tim’s live webnair’s now. I really like the way Tim teaches and explains trades. I am in Tim Skyes challenge. A opportunity to do a challenge like this would a great way to help me learn. I have made few trades and my record is not good. I would love to be apart of this paper trade competition. For both the experience that I would get from the coaching, and to be apart of the camaraderie that is established between the mentor and the student. I have a slight idea of what I am doing, after watching Tim in both the You Tube vids and the webinars that I was able to catch. Just need something to help push me over the edge to learn what skills I need to be a more confident trader.